Advanced MP3/WMA Recorder is a directly and real-time sound recorder software, which offers professional recording features with mp3 and wma support. 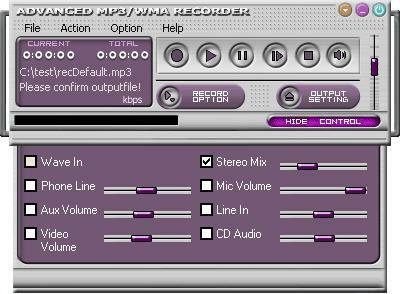 Advanced MP3/WMA Recorder makes a complete sound recorder studio of your computer. With Advanced MP3/WMA Recorder you can record sound from microphone, streaming audio from the Internet, or music played by Winamp, Windows Media Player, Quick Time, Real Player, Power DVD, Flash, games, etc. Sound quality of the recordings remains excellent, or sounds even better for Advanced MP3/WMA Recorder reduces noise. 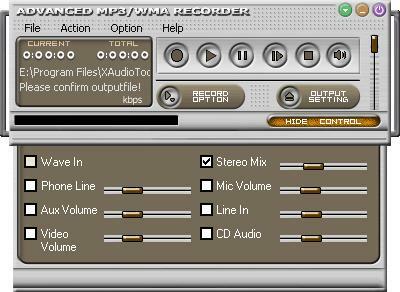 Advanced MP3/WMA Recorder is able to automatically detect the recording formats your sound card supports and then set the application's parameters for the best possible performance. Your recordings are then saved as Mp3,Wma or Wav files. Advanced MP3/WMA Recorder have directly to disk ability allows you to record sound without running out of memory as long as there's enough disk space. Advanced MP3/WMA Recorder can record directly to mp3 or wma audio format, and saving you valuable disk space not using any temporary files. 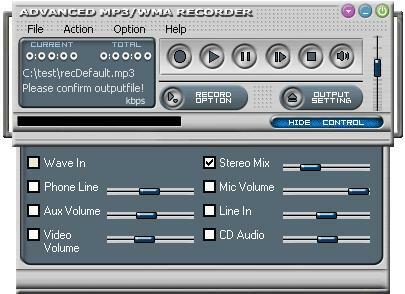 Advanced MP3/WMA Recorder interface is easy to use and perfect for both novice and expert PC users. Record from any sound sources only if you can hear it. Power mp3 encoder setting with VBR,CRC,Filtering support. Using Windows media encoder v8.0. Support 48000/44100/32000/24000/22050/16000/12000/11025/8000Hz, Mono/Dual Channels/Forced Joint Stereo/Joint Stereo/Stereo. Playback mp3,wma and wav files. Supper Timer and Record Scheduler.